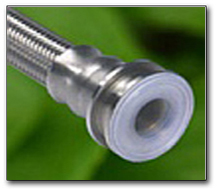 Customers frequently ask for the ultimate in PTFE lined flexible hose. This product incorporates the advantages of both convoluted and smoothbore designs. It is sufficiently flexible, like convoluted, yet which retains the advantages offered by smoothbore (like fast flow rate and cleanability).